Fellowship Previews: Valiant's ONE DOLLAR DEBUTS Return October 15th – With All-New Quote Covers! Valiant's ONE DOLLAR DEBUTS Return October 15th – With All-New Quote Covers! In comic shops everywhere next week, get seven of Valiant's greatest most beloved #1 issues for just one dollar apiece with an all-new wave of ONE DOLLAR DEBUTS! You've seen the reviews. You've heard the buzz. Now discover the best-selling, critically acclaimed first issue smashes that made Valiant one of the most adored publishers in superhero comics today. Now featuring brand new quote covers, Valiant's ONE DOLLAR DEBUTS are your best chance yet to discover Valiant's award-winning ongoing series – ARCHER & ARMSTRONG, HARBINGER, QUANTUM AND WOODY, RAI, UNITY, and X-O MANOWAR – before Jeff Lemire, Matt Kindt, and Paolo Rivera draft all of Valiant's greatest heroes into a battle ten millennia in the making for THE VALIANT #1 (of 4) in December! Plus: get the essential backstory on each of Valiant's most formidable heroes and villains with the VALIANT UNIVERSE 2014 HANDBOOK, featuring highly detailed entries on everything you need to know about the Valiant Universe in 2014 and beyond – from Archer to Generation Zero! Also including a selection of artwork from a murderer's row of Valiant greats – including Doug Braithwaite, Clayton Crain, Clayton Henry, Bryan Hitch, Esad Ribic, and many more – this is the perfect all-in-one introduction to the heaviest hitters that Valiant has to offer! Before VALIANT NEXT unleashes six epic new series – THE VALIANT, IVAR TIMEWALKER, DIVINITY, IMPERIUM, NINJAK, and BLOODSHOT REBORN – in 2015, revisit the foundations of Valiant's fan favorite ongoing series with these must-read ONE DOLLAR DEBUTS, arriving in comic shops everywhere on October 15th! After years of training, Obadiah Archer has been dispatched to New York City to root out and kill the infamous Great Satan of his parents’ sect. Unfortunately, dying has never been easy for Archer’s target – the hard-drinking year-old immortal known as Armstrong. Together, this unlikely pair of heroes is about to stumble headfirst into a centuries-old conspiracy that will bring the whole of ancient history crashing down on the modern day Valiant Universe. And that’s going to mean one Hell of a hangover. Read minds. Bend steel. Break all the rules. Teenager Pete Stanchek is out of work, on the skids, and – unbeknownst to him – a psionic-powered “harbinger” with the potential to reshape the course of human history. Toyo Harada is a wealthy business magnate, a respected philanthropist and the most powerful harbinger of all – or so he thought. As they forge an uneasy alliance, will Harada offer Pete a chance for redemption ­– or attempt to induct him into a secret network of conspiracy, subversion and control? Pete is about to discover that he’s not alone in the world and, soon, the generation who has nothing will take on the man who has everything. Once upon a time, Eric and Woody Henderson were inseparable. Adopted brothers. Best friends. Brilliant minds. Years later, they are estranged siblings, petty rivals, and washed-up failures. But when their father’s murder leads them into the throes of a life-altering scientific accident, Eric and Woody will find themselves with a whole new purpose – and a perfectly legitimate reason to wear costumes and fight crime. Go big or go home, folks! Quantum and Woody are coming! To kill a king, he has created an army. The world’s most dangerous man, Toyo Harada, has been struck by the one thing he never thought possible – fear. Halfway across the globe, a new power threatens to topple modern civilization and, to preempt the cataclysm that is to come, Harada will unite the most lethal, most volatile, most unforgiving team the world has ever known – UNITY. Their mission: defeat the warrior king armed with the universe’s most powerful weapon. Kill X-O Manowar! Born into battle, Aric of Dacia — heir to the throne of the Visigoth people — has never known peace. 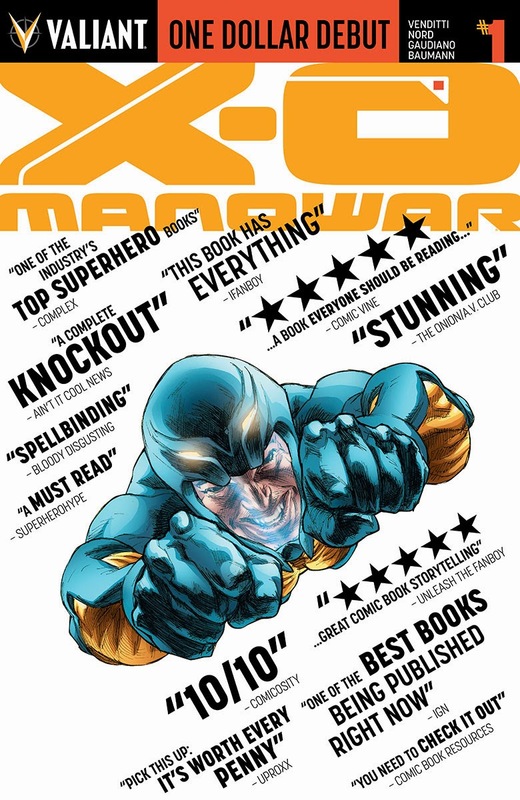 After a brutal encounter with a mysterious enemy known as The Vine leaves him a prisoner on an alien world, the only hope Aric has of returning to his family and saving them from slavery is to seize a weapon of incalculable destruction and become X-O Manowar! The Valiant Universe from A to Z! Discover for the very first time the untold origins and secrets of Valiant’s heroes and villains, all in one place! Featuring artwork from a “murderer’s row” of comics brightest talents: Doug Braithwaite, Clayton Crain, Clayton Henry, Bryan Hitch, Esad Ribic, and more!